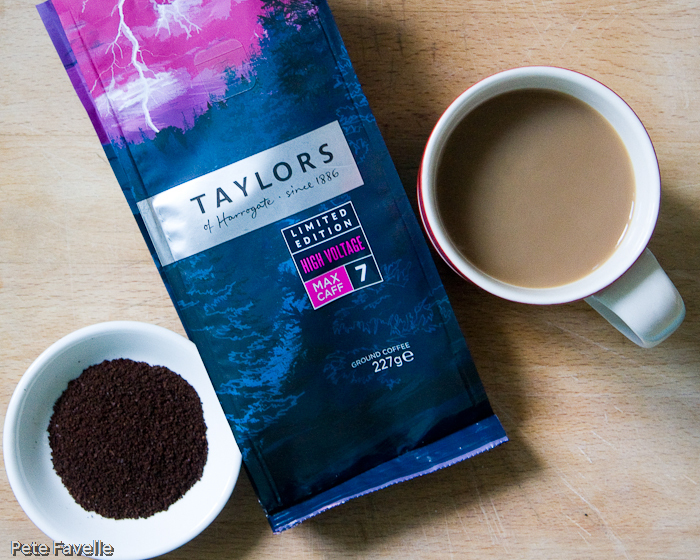 I’m a big fan of Taylors – their coffee is easily available, well priced and generally pretty damn tasty. In recent months their range has expanded, with the arrival of “single origin” coffees, showcasing the character of four bean-producing nations – and hopefully more to come. Happily, their blended range remains – when I first saw the new single origin packs in the shops, I briefly worried that it marked the impending demise of my much-loved After Dark – and even boasts a new addition in the form of today’s limited edition. High Voltage is a limited edition “max caff” coffee, which sounds right up my street. Unusually for ‘premium’ coffee, it uses Robusta beans rather than the Arabica. On the face of it this makes sense, as Robusta has a higher caffeine content, but it also has less sugar (which affects how it roasts) and a ‘harsher’ flavour. Still, it’s perfectly possible to have a decent cup of Robusta coffee, no matter what the Arabica-loving experts tell you so let’s see how Taylors have done! The grounds have a deeply roasted aroma with chocolate oranges and gently caramelised sugar, and just a little woodiness in the background. Brewed, the fruit is lost and the wood character becomes more pronounced; it picks up a slightly burnt edge and ends up reminding me of a cold, damp forest fire. In the mouth, it’s full bodied with a little sweet creaminess and a subtle fruit that I can only describe as over-ripened plums. Quickly hiding that though, is a pretty significant and lingering bitterness. It’s frustrating, because I think that lurking behind that bitterness are some interesting flavours. Still, it’s not a coffee that aims to be subtle or sophisticated – if you like your coffee to have some proper ‘wake-up’ character (and I do!) then this is definitely worth checking out. 4 stars, and a plea to Taylors to consider keeping it in the range! Hi, i find very interesting this article, i have a question, is this coffee sell internacional, where are the principal stores where i can find it, thanks! I’m afraid I don’t know – you might find it in any stores which normally carry Taylors, but it is described as a Limited Edition so it’s hard to know how much was exported.